The names are familiar to today's consumers. 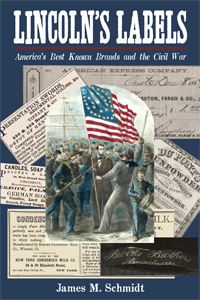 In homes across America, you can find the products of companies that supplied Union soldiers and sailors. They range from the obvious, such as gunpowder from du Pont and uniforms from Brooks Brothers, to equally necessary items such as soap from Procter & Gamble and condensed milk from Borden’s. In Lincoln’s Labels, James Schmidt relates the rarely-told stories of these and other companies that played an important role in the Civil War by supplying food, medicine, clothing, weapons, and services as grim as shipping home the bodies of the fallen. The book also explores how the war affected the companies. Each firm has a tale that mirrors the war itself: family and friendships torn asunder, political intrigue, pitched battles, and paths crossed with the book’s namesake, Abraham Lincoln.